Eminem releases 'Walk on Water' video, watch here! - Ooooooo La La! Eminem releases 'Walk on Water' video, watch here! After teasing it earlier this week, Eminem has released his music video for “Walk on Water,” the first single from his new album, Revival. 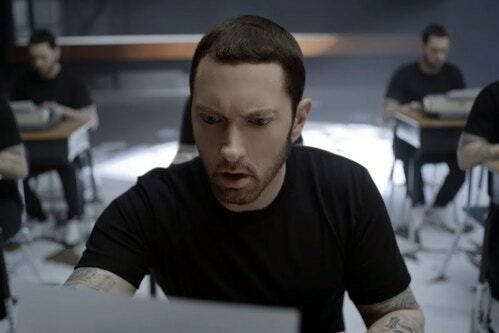 In the clip below, which was first released through Apple Music, Eminem raps alone with a mic stand in a dark room before entering a class full of his clones. Although Beyonce is featured on the track, she does not appear in the video. Sorry, Bey Hive!